Coincidentally with Dakotas, The Open Mind were also initially named after a Native American Indian tribe. The Apaches were formed by Tim du Feu, Mike Brancaccio, Philip Fox and Ray Nye. Ray When Ray Nye left Terry Schindler was drafted in and they changed their name to The Drag Set and released a single. Shortly thereafter they changed their name to The Open Mind and in July 1969 released a self-titled LP which has since become a highly sought-after collectable. The band, however, is best known for its druggy August 1969 single Magic Potion which did not appear on the album. 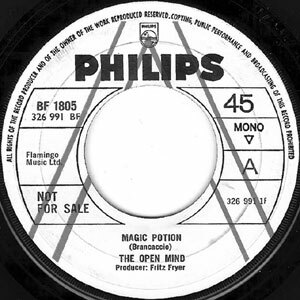 ir paucity of recorded material, The Open Mind have proven to be influential in the psychedelic rock genre, their single Magic Potion having been covered by bands such as The Seers and Sun Dial. 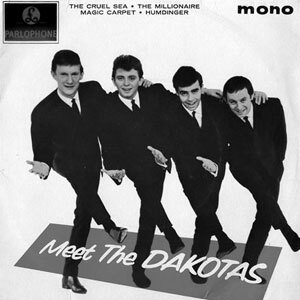 Founded in September 1960 the original line-up of Robin MacDonald, Bryn Jones, Tony Mansfield and Ian Fraser gained their name when the manager of the Plaza Ballroom in Oxford Street requested they dress as Native American Indians and be called Dakotas. After a few line-up changes Brian Epstein offered them the opportunity to be the backing band for Billy J Kramer and like the The Beatles before them they were sent to the night clubs of Hamburg to perfect their act. Despite releasing a few instrumental singles under their own name they never achieved chart success and they parted company with Kramer as his career declined through alcoholism. By the time The Spider And The Fly was recorded, Robin MacDonald was the sole survivor of the original Dakotas line-up. Ex-Pirates guitarist Mick Green had drafted in fellow ‘pirateer’ members and an unknown American sessionist was employed to provide vocals. The track itself is a masterful hotch-potch of the Dakotas trad beat style, a heavier freakbeat rhythm, earworm guitar hooks and a jolly big dollop of proto-glam.